I love Paul's challenge to Timothy to be faithful to what he had been taught and to remember why he could trust what he had been taught. 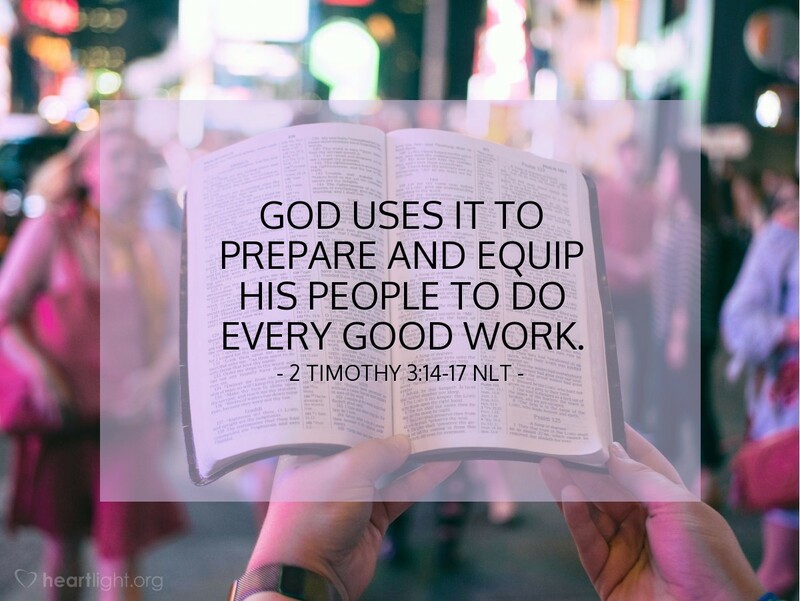 Paul reminded Timothy that Scripture can make us wise, give us faith, correct us, teach us, prepare us, and equip us in two important ways: (1) through a Spirit-filled mentor or parent, and (2) through the Scriptures themselves, which he describes as holy and inspired (God-breathed or Spirit-inspired). The Scriptures' power lies in the words the Spirit inspired and the people who show the transforming influence of the Spirit at work in their lives. Why wouldn't we be eager to let the "sword of the Spirit" (God's word, Ephesians 6:17) be at work in our lives? Almighty God, thank you for speaking to us in words. As I place myself under the guidance of the words of Scripture, dear Father, I pray that the Holy Spirit uses them to form me into a person who is increasingly more like Jesus each day. In the name of the Lord Jesus, I pray. Amen.